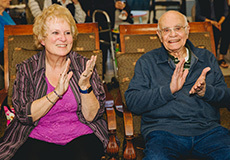 Dining at Sonoma Hills Retirement Community is a warm and social experience. Residents can enjoy three delicious meals a day from our dining room staffed with individuals that will provide personalized service. Our menu options are filled with fresh, seasonal fruits and vegetables often grown from our own organic garden and prepared by our chefs with years of experience. Meal options for each resident’s dietary needs are available. We strive to offer our residents plenty of choices. Our lunch menu allows residents to enjoy the self serve salad bar and homemade Soup Du Jour. We also offer a “Free Style Dining Menu” with extended dining room hours for our residents’ convenience so they can dine when they please. Meals are prepared by our trained chefs, using only the freshest produce, herbs and spices, as well as meat and seafood. Sonoma Hills’ chefs will gladly cater special events. We offer our residents a private dining room to entertain family and friends if needed. Click here to view our pdf version of our weekly menu items. All-Time Dining Menu is available from 12 pm – 6 pm. Grilled cheese sandwich with chips and your choice of swiss, provolone or cheddar cheese.